China's aviation industry is working on the development of aircraft with short takeoff and vertical landing capabilities needed for an important role in the Chinese navy's future operations, military experts said. "Research and development on components of STOVL aircraft, such as the engine, have started," Wang Ya'nan, deputy editor-in-chief of Aerospace Knowledge magazine, told China Daily. "The aircraft's principles are not new. They have been known for more than 40 years, so our aircraft designers should be able to develop the plane on their own," Wang said. In late March, the Aviation Industry Corp of China, the country's leading aircraft maker, announced on its website that two of its subsidiaries - AVIC Chengdu Engine Group and China Aviation Engine Establishment - have signed a cooperation agreement on the development of the STOVL aircraft's engine. The statement said the STOVL aircraft project aims to strengthen the People's Liberation Army navy's amphibious combat capability and address the absence of such a weapon in the PLA's arsenal. Compared with conventional fixed-wing aircraft, a STOVL plane can be readied for action in a shorter period of time and occupies less space in a hangar bay or on the deck of a ship. These features have made it a popular choice for naval powers since late 1960s, when Britain's subsonic Hawker Siddeley Harrier became the first STOVL aircraft to be put in service. Almost all STOVL aircraft in active service are based on the Harrier design, and they form the backbone of the naval forces of India and Spain. This move is not the first time China has aimed to build a STOVL aircraft. In the late 1960s, the PLA asked the aircraft institutes to develop a fixed-wing plane capable of vertical takeoff and landing. The project was later abandoned due to technical difficulties. 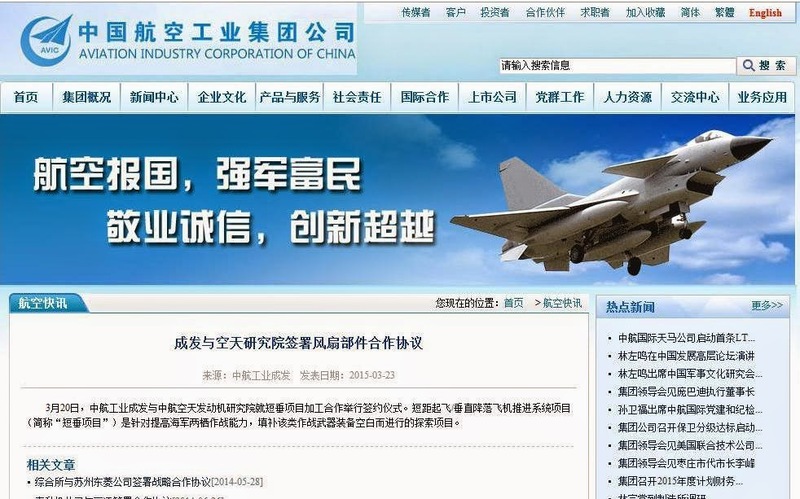 The PLA also tried to buy the Hawker Siddeley Harrier in the late 1970s, but dropped the attempt because of cost, according to Western military observers. This time, AVIC appears to have made the right decision at the right time as the PLA navy now needs a STOVL aircraft because it will "significantly supplement and improve its amphibious capabilities", Wang said. "Though the PLA navy now has an aircraft carrier - the CNS Liaoning - it still lacks the experience of developing and manufacturing such a sophisticated naval platform, so there won't be more carriers in the short term," Wang said. "Let's assume that a conflict breaks out between China and another nation in the near future; the PLA navy's limited number of carrier-borne fighter jets, the J-15s, would have to engage in long-distance strikes as well as air defense for the carrier battle group, and they would have to be divided into small groups to perform these tasks simultaneously." 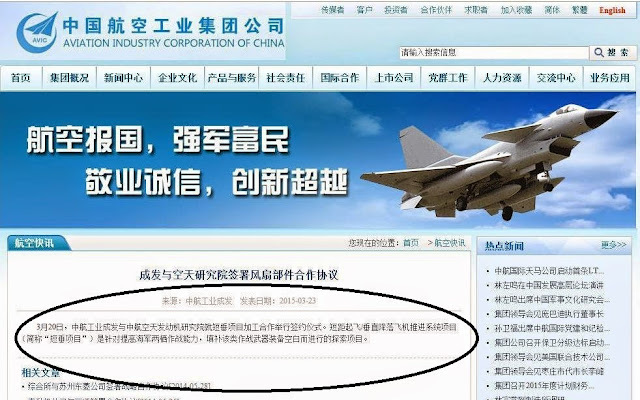 If China had STOVL aircraft, they could be deployed on the CNS Liaoning and other ships to defend against incoming enemy aircraft, relieving the burden on the J-15s, which could then focus on long-range operations, Wang said. "Actually, in the foreseeable future, I don't see a high probability of China's involvement in a war far from its shores. Being dragged into limited amphibious conflicts in or near our territorial waters would be more likely. The STOVL aircraft will be the best choice for air support in such conflicts," Wang said, noting that it would be a perfect match for China's future amphibious assault ships. In November 2013, Yin Zhuo, director of the PLA navy's Expert Consultation Committee, told China Central Television that China is developing an amphibious assault ship whose displacement will be 1.5 times larger than the Japanese Izumo-class helicopter destroyer's 27,000 metric tons. Liang Tianren, a Hong Kong military observer, wrote in Hong Kong's Ming Pao newspaper in January that China is building a 50,000-ton amphibious assault ship that can carry 20 helicopters and 12 STOVL aircraft. "The government decided to build amphibious assault ships after the outbreak of Libyan civil war in 2011, in which some Chinese-owned assets were seized or damaged. China then had few military hardware to protect its properties," Liang said. "The situation made the government realize the importance of amphibious assault ships, which can fulfill various naval operations as well as conduct evacuations or humanitarian missions," he said. The first Chinese amphibious assault ship will be built before the end of this year, he said, reporting at least four such vessels will be made. Once the first amphibious assault ship is built, the navy will have to choose a suitable aircraft for it, Wang said. "The comparatively short deck cannot accommodate the fixed-wing J-15, and attack helicopters like the WZ-10 are slow and have a limited choice of weapons. But STOVL aircraft are fast - the maximum speed of the F-35B is nearly 2,000 km/h, and it has strong firepower," he explained. Vasily Kashin, a senior China analyst at the Center for Analysis of Strategies and Technologies in Moscow, told Sputnik News Agency, "If the PLA navy's amphibious assault ship is equipped with STOVL jets, it can be used as a light aircraft carrier, further adding to its combat capability." Senior Captain Zhang Junshe, a researcher at the PLA Naval Military Studies Research Institute, told China Daily: "The navy can deploy helicopters and STOVL aircraft on the amphibious assault ship, designating helicopters to conduct anti-submarine tasks and using STOVL planes to perform mid-and long-range air defense as well as air-to-surface strikes." The PLA air force will also find potential in STOVL aircraft, Wang said. "Compared with conventional aircraft, STOVL planes are quicker and more convenient to use in contingencies and conflicts because they have few airport or runway condition requirements. Even a poorly equipped airfield or takeoff/landing point can deploy a lot of them," he said. "They would be a good guard for front-line air bases." If the air force's bases were under attack, leading to conventional aircraft being grounded, STOVL fighter jets would still be able to take off to fight, gaining time for repairing the damaged bases and adding resilience to the air force, Wang said. Lockhead acquired alot of VTOL related expertise from them in the early 90s so the F-35 uses Yak-141 technology.